ClergySpirit: Is the Disciple Making Mantra Working? We have an impressive apparatus for making disciples of Jesus. It aligns with our mission statement quite nicely! How's that workin' for ya? If it's possible, drop that latest disciple making toy. Consider the spiritual struggle to completely follow Jesus, your Light and your Salvation. Remember the folks that Jesus loved and taught, among them a rich young man (Mark 10:21-22)? He knew what Jesus was about, but he was not free to follow him. The hard work of following Jesus "unreservedly," as Henri Nouwen put it in The Road to Daybreak, sometimes flouts our best efforts at invitation. As he wrote, "In the past I wanted to know where to go. Now I knew where to go, but didn't really want to." If someone like Henri Nouwen could write these words, and share his own struggle to follow Jesus even more fully, why isn't there more honesty about following Jesus- the kind that comes from the depths of our being? Is it about trying to sell something we ourselves are not buying? I'm not sure we can be honest about discipleship if we're not on the journey ourselves, attending to our spiritual life and sharing it. 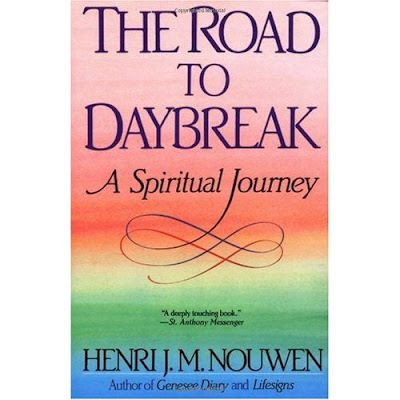 Nouwen chose the venue of the journal as well as books, lectures, and finally, his own ministry with the disabled. But honesty requires being on journey in the first place. We prefer a position of strength. I envision myself with no unsavory givens, that is, no weighty baggage. Implicit in most "grids" I've seen is the assumption of being "fixed." People may decide that this discipleship stuff is not for them- unless they can find a way to look good, to hide the messiness of their existence. It doesn't even enter our minds that our true vocation is always connected to the struggle to be whole, grounded in our own brokenness and healing. Churches large and small tend to make "following Jesus" into "copying Jesus." We neglect our true self and our true life in the Holy Spirit. We try our best to schlep up somehow, on our own, a life as Jesus lived and taught. But it's communion with God, receiving Christ into ourselves that leads to the fruit of the Spirit, not the other way around. In valuing the result over the Source, we obscure the gift that makes discipleship possible. Belonging in Christian community trumps any kind of assembly-line process. What we find pleasing about any scheme is that we think we can fit bunches of people into it and thereby churn more "disciples" out of it. But patience, gentleness, and love is not necessarily the fruit of such efforts to impose our form of discipleship on others. Basically we put too much trust in disciple-making. We want it manageable, measurable, even easier, without risk. What then? Without a master plan, we're left with a simplicity with all it's beauty and breadth and depth: our desire to receive Jesus, to be formed by Holy Spirit, and willingness to stay on the journey with others. May your spirit be refreshed with the gift of curiosity and wonder and joy. Thanks for such a honest and insightful post. Although I agree that our goal if to "make disciples of all nations", I find that we aren't always very good at detailing what that really involves. Several times throughout the Gospels, Jesus warned us to "count the costs" before deciding to follow Him. May churches like to paint a rosy, "prosperous" picture of discipleship, when in actuality it is often a painful, difficult and self-abasing journey. Much like the disciples who "gave up" in John 6:60-66, many modern would-be disciples decide that this whole discipleship path that they have set out on isn't quite what they bargained for whenever they realize for themselves what all is really entailed. I do think that we should continue to strive to make disciples, but I think that many of us could do a better job of warning new Christians of the potential costs beforehand.